Caesarea Maritima was named in honor of Augustus Caesar. The city was described in detail by the 1st-century Roman Jewish historian Josephus. The city became the seat of the Roman prefect soon after its foundation. Caesarea was the “administrative capital” beginning in 6 CE. This city is the location of the 1961 discovery of thePilate Stone, the only archaeological item that mentions the Roman prefect Pontius Pilate, by whose order Jesus was crucified. The emperor Vespasian raised its status to that of a colonia. After the destruction of Jerusalem in 70 CE, Caesarea was the provincial capital of the Judaea Province, before the change of name to Syria Palaestina in 134 CE, shortly before the Bar Kokhba revolt. In Byzantine times, Caesarea remained the capital, with brief interruption of Persian and Jewish conquest between 614 and 625. 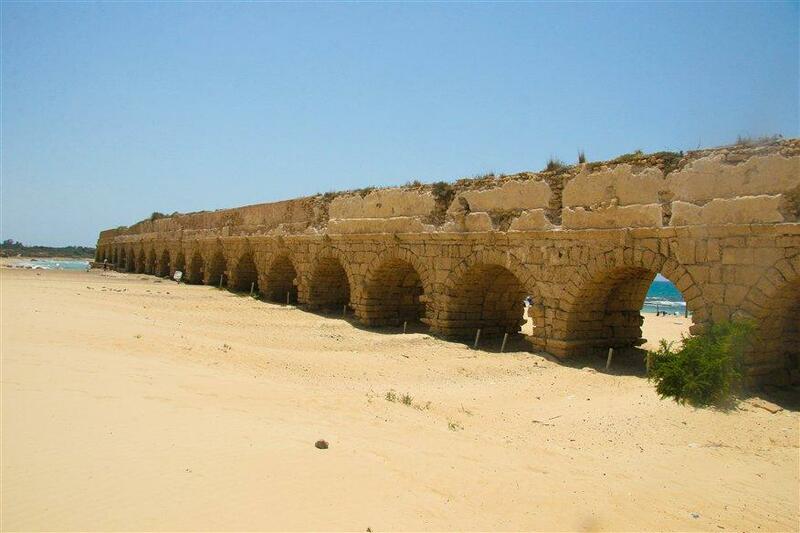 In the 630s, Arab Muslim armies had taken control of the region, keeping Caesarea as its administrative center. In the early 8th century, the Umayyad caliph Suleiman transferred the seat of government of the Jund Filastin from Caesarea to Ramla. Herod built his palace on a promontory jutting out into the sea, with a decorative pool surrounded by stoas. 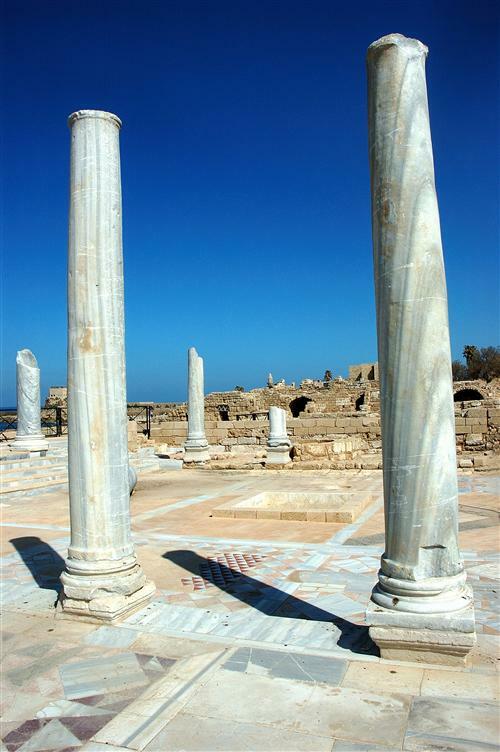 In 6CE, Caesarea became the civilian and military capital of Iudaea Province and the official residence of the Roman procurators and governors, Pontius Pilatus, praefectus and Antonius Felix. Josephus describes the harbor as being as large as the one at Piraeus, the major harbor of Athens. Remains of the principal buildings erected by Herod and the medieval town are still visible today, including the city walls, the castle and a Crusader cathedral and church. 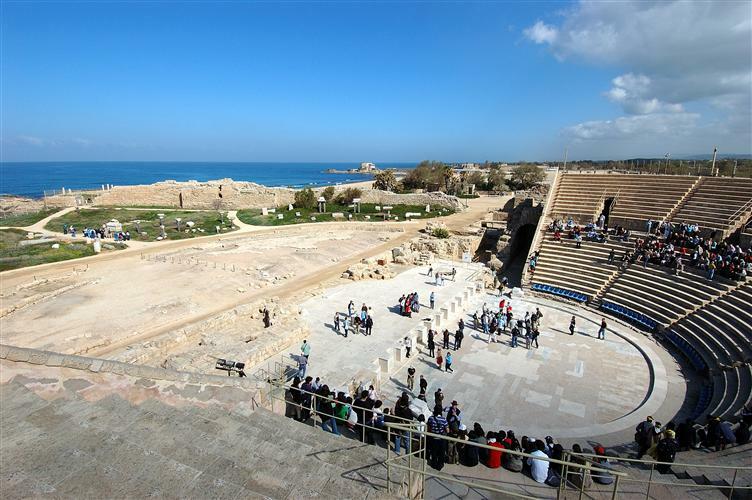 Caesarea grew rapidly, becoming the largest city in Judea, with an estimated population of 125,000 over an urban area of 3.7 square kilometres (1.4 sq mi). In 66 CE, the desecration of the local synagogue led to the disastrous Jewish revolt. In 69, Vespasian declared it a colony and renamed it Colonia Prima Flavia Augusta Caesarea. In 70 CE, after the Jewish revolt was suppressed, games were held here to celebrate the victory of Titus. Many Jewish captives were brought to Caesarea Maritima and 2,500 were slaughtered in Gladiatorial games. After the revolt of Simon bar Kokhba in 132, which ended with the destruction of Jerusalem and expulsion of Jews, Caesarea became the center of Early Christianity in Palestine. In 638 the city, capital of Byzantine Palestine and an important commercial and maritime center, was conquered by the Muslims, allegedly through the betrayal of a certain Yusef, who conducted a party of troops of Muawiyah through a “secret tunnel”, perhaps the extensive Byzantine sewers, into the city. The Persian historian al-Baladhuri, who offers the earliest Muslim account, merely states that the city was “reduced”. The 7th-century Coptic bishop John of Nikiû, mentions “the horrors committed in the city of Caesarea in Palestine”. created there, as was one of the four archbishoprics in the kingdom (see Archbishop of Caesarea). A list of thirty-six Latin bishops, from 1101 to 1496 has been reassembled by 19th century papal historians; the most famous of these is probably Heraclius. After that the Latin “Bishop of Caesarea” became an empty title. Saladin retook the city in 1187; it was recaptured by the Crusaders in 1191, and finally lost by them in 1265, this time to theMamluks, who ensured that there would be no more battling over the site— where the harbor has silted in anyway— by razing the fortifications – in line with their practice in other formerly-Crusader coastal cities.